If the secret to winning an office pool is going against the grain, then you may want to find another team besides Duke to get behind. More than three-quarters of all Yahoo users like the top-seeded Blue Devils to emerge from the East Region. They’re at least three times as popular a national championship pick than any other title contender. Here’s a look at who Yahoo users like to pull upsets, to reach the Final Four and to win the national championship in this year’s Yahoo Sports Tourney Pick’em. And just in case you want the thoughts of a college basketball writer with a long history of picking Final Four teams who fail to make it out of the opening weekend, I also offered my thoughts on where I agree and disagree with popular opinion. My take: Maybe this pick is a result of Florida being the more name-brand, tradition-rich program because I don’t see a basketball justification. Nevada has a bunch of 23-year-olds who made the Sweet 16 last year and returned to school with ambitions of advancing further this March. Florida starts three freshmen and two erratic seniors, lost 15 games and wasn’t a lock to make the NCAA tournament before beating LSU in the SEC quarterfinals last Friday. Nevada hasn’t played especially well the past month and star Jordan Caroline will have to play through an Achilles injury, but I expect the Wolf Pack to be ready for NCAA tournament play. My take: Chris Holtmann squeezed the most out of this pedestrian Ohio State roster to get the Buckeyes to the NCAA tournament, but they are at a major talent deficit in this game. Iowa State has a lineup full of guys who will be paid to play basketball in the near future, whether that is in Europe or the NBA. Ohio State dropped seven out of 10 entering the NCAA tournament, albeit three without Kaleb Wesson. Iowa State also hit a late-season rough patch but seemed to emerge from it while winning the Big 12 tournament. My take: The public loving a 27-win mid-major with the potential No. 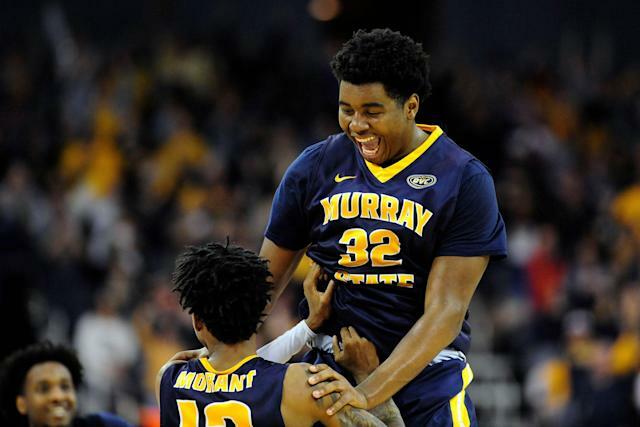 2 pick in the NBA draft is hardly a big surprise, but it’s worth noting that Belmont is the only top 100 team Ja Morant’s Murray State Racers have beaten this season. You have to count on Morant putting his team on his back just like he did for stretches of the OVC title game. Marquette enters this game having dropped five of its past six, but the Golden Eagles still aren’t an ideal draw for Murray State in some respects. The Racers don’t have a perimeter stopper to put on Markus Howard, nor do they have the outside shooters to unlock a Marquette defense that is good at making it hard to score at the rim. My take: Finally, one I like! UC Irvine (30-5) hasn’t lost since mid-January, ranks higher in Ken Pomeroy's efficiency ratings than No. 11 seeds Temple and St. John's and matches up well against Kansas State. The Anteaters are among the best in the nation at giving up nothing easy at the rim and the Wildcats are a poor perimeter shooting team that could be especially limited from behind the arc if sharpshooting forward Dean Wade isn't healthy enough to play. The last time UC Irvine made the NCAA tournament, Russell Turner's team pushed Louisville to the buzzer in 2015 before falling 57-55. There's reason to believe this year's Anteaters may be an even tougher out after watching them topple Texas A&M and Saint Mary's in non-league play before rolling to their fourth Big West title in six years. My take: Only 43.7 percent of Yahoo users project the top-seeded Cavaliers to reach the Final Four, but they’re still the fourth-most popular Final Four pick in the field. Considering Virginia’s bleak recent NCAA tournament history, some healthy skepticism is to be expected. In addition to last year’s historic first-round meltdown against UMBC, the Cavaliers also suffered early losses against lesser-seeded Michigan State teams in 2014 and 2015 and squandered a late lead in the 2016 Elite Eight against Syracuse. They’ll seek redemption this season behind their usual disciplined defense and the most efficient offense of Tony Bennett’s tenure. My take: All four No. 1 seeds crack the top four, with Duke leading the way to no one’s surprise. Tennessee is the most popular choice among No. 1 seeds, while Texas Tech (3), Florida State (4) and Villanova (6) are the most popular long-shot picks. My take: Here’s where it becomes clear how big a title favorite Duke is. Three times as many people are picking the Blue Devils as the North Carolina team that beat them twice without Zion and then played them virtually even with him in the ACC semifinals. The top choices behind this quintet: Kentucky, Tennessee, Michigan, Houston and Villanova. My take: Almost three percent of you see Gardner Webb pulling off UMBC part II. The Bulldogs are the highest-rated No. 16 seed and it’s only human nature for the Cavaliers to start pressing if they fall behind, but there’s also a reason this has only happened once in the history of the NCAA tournament before. My take: I included this only because the amount of support for the reigning national champs surprised me. The sixth-seeded Wildcats lost their top four players from last year’s juggernaut team and have been far more vulnerable this season despite sweeping the regular season and tournament titles in a down Big East.